Has your highway network had a checkup lately? Are your resources being allocated strategically to achieve the best value? Will current and planned reconstruction, rehabilitation, and preservation work produce a net improvement in the condition of your network? A newly updated brochure available from the Federal Highway Administration (FHWA) and the National Center for Pavement Preservation (NCPP), A Quick Check of Your Highway Network Health (Pub. No. 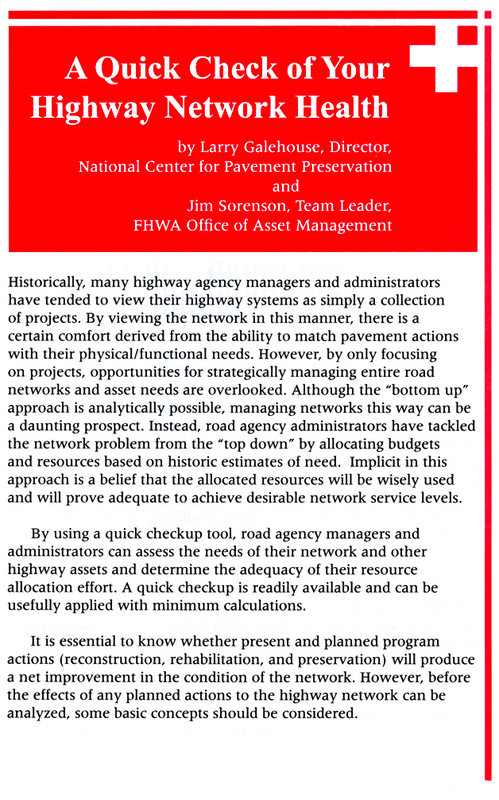 FHWA-IF-07-006), provides a tool for highway agency managers to assess the needs of their pavement networks and determine if their resource allocations are adequate. The quick checkup tool generally uses information that an agency has at hand or data generated by the agency's management systems. The updated brochure includes "A Quick Highway Network Evaluation Worksheet," which is a detachable worksheet that agencies can use to perform a pavement network evaluation. "Using the quick check tool, an agency can examine the effect of planned reconstruction, rehabilitation, and preservation work on pavement life and deterioration using their own data," says Joe Gregory of FHWA. For example, an agency would first evaluate reconstruction and rehabilitation work by examining the lane miles, design life, and lane-mile cost for each proposed project or planned strategy. Pavement preservation treatments would then be evaluated by examining the life extension offered by the treatment. These treatments, including concrete joint resealing, thin hot-mix asphalt overlays, microsurfacing, and chip seals, can extend the life of roads in good condition. After performing the different evaluations, an agency can decide how to best allocate funds among reconstruction, rehabilitation, and preservation work to achieve the greatest improvement in its overall network condition. The Quick Check brochure is available on FHWA's System Preservation Web site at www.fhwa.dot.gov/preservation/library.cfm. Also available is an Excel® spreadsheet version of the highway network evaluation worksheet and a Powerpoint® presentation on the quick checkup tool. For more information or to obtain a printed copy of the brochure, contact Joe Gregory at FHWA, 202-366-1557 (email: joseph.gregory@fhwa.dot.gov), or the NCPP, 517-432-8220 (www.pavementpreservation.org).